Designed to maintain proper carbonate hardness, calcium, and trace elements in reef aquariums. Base Elements is a balanced 4 part system that helps increase coloration, polyp extension, and overall coral health. Base Elements is intended to be a stand-alone product and not recommend to be used with other two-part dosing systems. 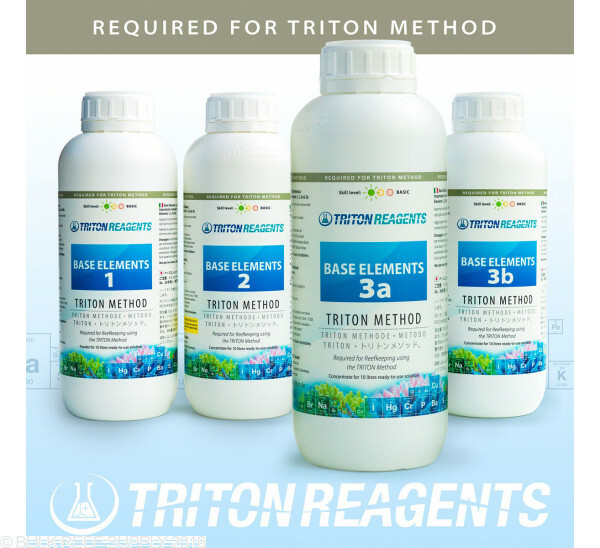 Triton Base Elements is a concentrated system that has been developed for reef tank dosing. The concentrated solutions are diluted by you and create a simple 1:1 dosing system that follows your aquariums alkalinity levels. The system was created to provide an essential macro and trace elements that are consumed by corals and other animals in the reef aquarium. Part 1 - This part comes in a granular form and should be mixed with 9.66L of RODI water in a dosing container. Part 2 - Mix the entire contents of Part 2 with 9L of RODI water in a dosing container. Part 3A - Mix the entire contents of Part 3A with 9L of RODI water in a dosing container. Part 3B - Mix the entire contents of Part 3B with 9L of RODI water in a dosing container. Mixing notes - It is important to create the same dilution of each component. After mixing, keep each component separate and do not further mix parts together. If you do not want do any mixing or diluting check out Triton Core7 Base Elements. We highly suggest using Triton ICP-OES testing to establish a baseline, and for dosing recommendations. Prior to dosing your aquariums alkalinity should be adjusted to 8 dKH. As a baseline starting dose, Triton recommends 10mL of each component every day per 100L of system volume. Alkalinity testing should be done on a daily basis for the first couple weeks so that consumption can be adjusted for accordingly. Base Elements uses a 1:1 ratio - for every 1mL of Part 1 you use, you should be using 1mL of Part 2, Part 3A, & Part 3B. Want to learn more about the Triton System? A Guide to the Triton Method - This guide was made to give you the necessary information on how to use the Triton Method. Triton Method Beginners Guide - A high-level overview of what the Triton system is and how to implement it. 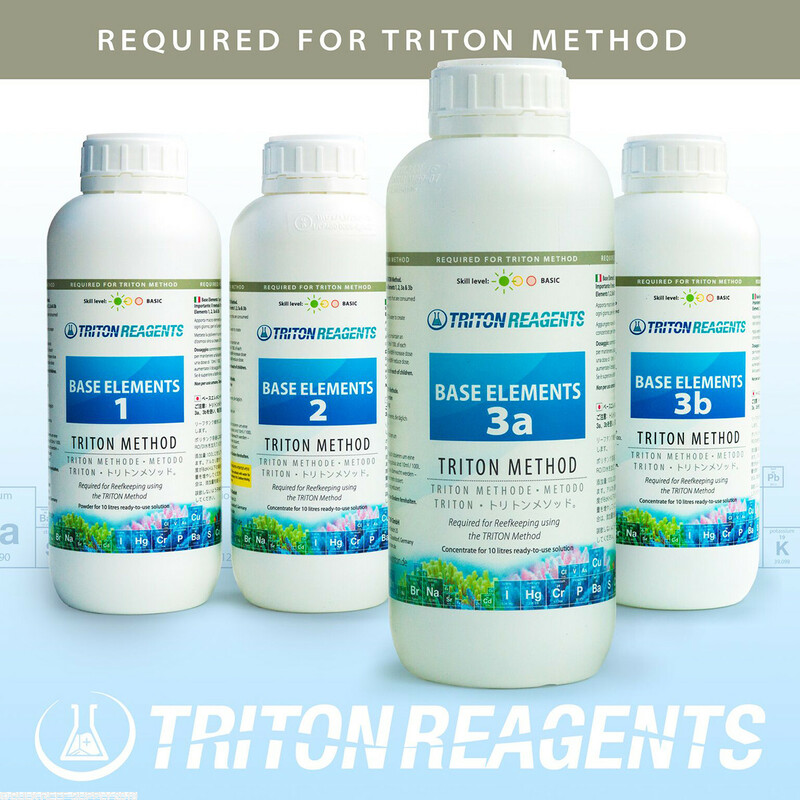 The Triton Method Full Guide - The full guide for how to set up an aquarium system for the Triton Method with the science and principles behind it.